Two nights ago, that is to say, the night before my fifth C-section, I couldn't sleep. I paced. I lay in bed. I tried to force myself to go to sleep, which was pretty much impossible. I started to fall asleep and then jerked awake. Sometime between the sun sinking behind the horizon and morning I stole about two hours of sleep... and then it was four a.m. and it was time to get up and go to the hospital. So Paul and I hopped in the car and headed north. We were up before the sun. Things went fast once we got to the hospital. I changed into a gown. After three tries an IV was finally taped into place (ouch!). I answered a few dozen questions and managed not to cry when it took two tries to place the epidural. 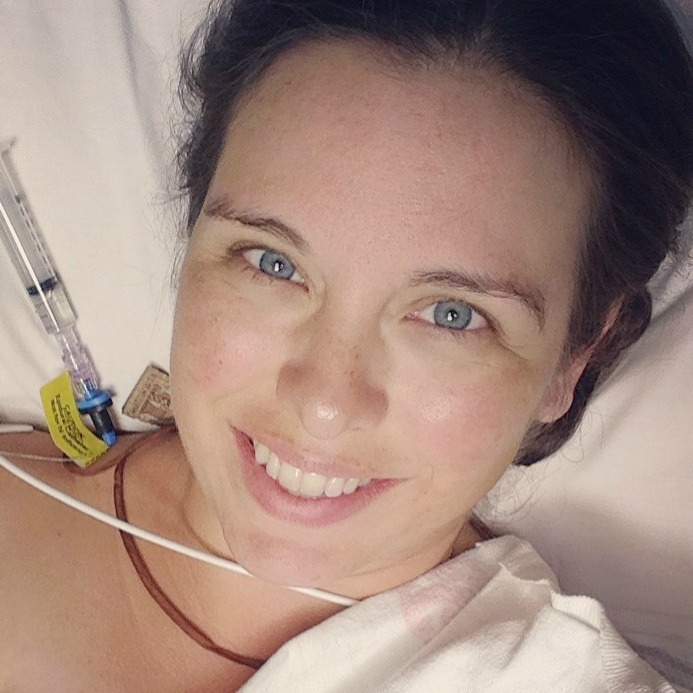 It was the tenth time a needle had been that close to my spine for a spinal or epidural and my fear may not be quite a phobia, but it comes close, and I was hugely relieved when it was over. Me, arriving at the hospital. And then Paul got to change into his neat little outfit. And of course it was an outfit that I had to document. I was happy that my OB, who has been my doctor for the past three pregnancies, but who won't be seeing patients anymore after yesterday because he's going to be moving to an administrative job, was the one to do the C-section. At 8:58 am Mary-Therese Philomena let the world know that she had arrived with a loud squaking baby cry. The doctor announced that she was a solidly built baby, which she is at 8 lbs 12 ounces (although that does make her the second smallest of the babies in our family), and after toweling her off for about a minute she was placed on my chest, where she immediately began to nurse. My doctor told me that my uterus is in amazing shape, that the scarring wasn't bad and that there was no thinning and no windows! If I hadn't been lying on a surgical table I would have danced around. Tessie nursed for the half forty minutes it took to sew me up. And then she nursed for another two hours in recovery. She nursed on her way from recovery to our new room. And she nursed as we settled into our new room. Everyone who watched her nurse for basically the first three hours and fifty five minutes of the first four hours of her life was pretty impressed that she was able to eat for that long, including me. She definitely had figured out exactly what she needed to do to fill her little tummy, and we could hear that she was filling her tummy when they listened to it with a stethoscope in recovery. And as for me? I was feeling pretty amazing. I thought it was just a really easy C-section. I realized today that it had more to do with the morphine that they put in my epidural, that carried me through yesterday. It made walking super easy. I could do just about anything for twenty-four hours, when it wore off and I felt like a truck had hit me. This, obviously, is before the morphine in the epidural wore off. Way, way before. And that is the story of how Mary-Therese was welcomed into the world. So far she prefers nursing to everything else, and her second favorite thing is being held, all day and all night if that's at all possible. And it mostly has been. After sleeping roughly four hours in the past 60 hours... I'm hoping to get a little bit more sleep tonight. Although I have a feeling our little Tessie has different plans! She is adorable. My third c-section they added something to the epidural that kept my uterus pain free for MUCH longer than the rest of me-- which was awesome as it allowed me to do the walking they always insist on. You are amazing! Oh my goodness! She is beautiful!! She looks just like her sisters. Awwww! Glad the delivery went so smoothly! Here's to hoping (and praying) that the recovery starts to pick up! She's beautiful! So glad everything went smoothly! I get that about the epidural though. We had our third in Dec and I'm just glad I got through it! Also, so glad your dr said everything looked well! Such great news! Prayers for a smooth and swift recovery and for a lovely babymoon with your sweet girl! Nursing and being held...sounds about right! Enjoy the snuggles! Gorgeous baby! Love her name and nick name. Congratulations on another beautiful baby! Congratulations! I just had my 4th C-section (10.5 months after my 3rd!!) and my doctor told me I healed like cement and if he hadn't seen the proof he would never have believed they were so close together. Medicine sometimes says no to big families...God says yes! Take it easy and enjoy your baby girl.